Some places in this world are so grand that they inspire us. They evoke questions and curiosity as we marvel in their presence. One of those such places is the Statue of Liberty located in New York. What facts about the Statue of Liberty would you want to know? Here are some Statue of Liberty facts that is great fun for everyone including adults, students, and even kids! Does the Statue of Liberty get struck by lightning? Is the Statue of Liberty a man or a woman? What is written on the Statue of Liberty Tablet? Does the Statue of Liberty have chains and a broken shackle? When did the Statue of Liberty become a National Monument? What is the significance of the crown? Which way does the Statue of Liberty face? 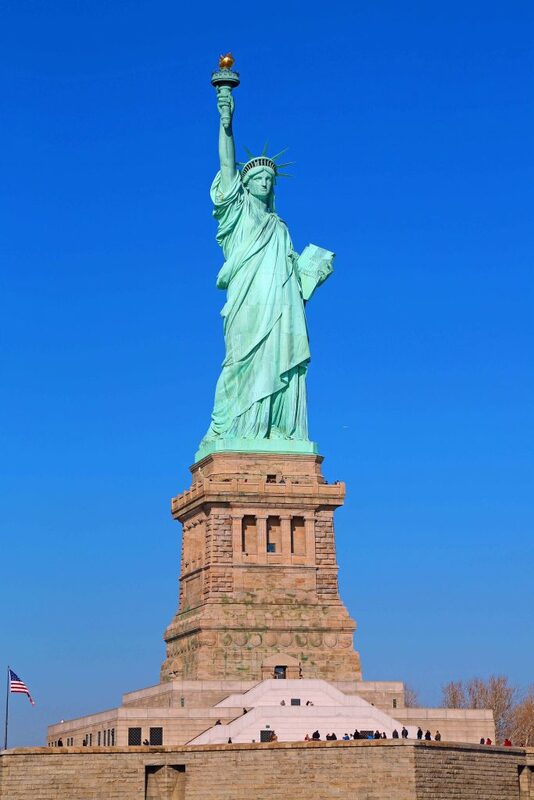 When was the Statue of Liberty’s torch replaced? 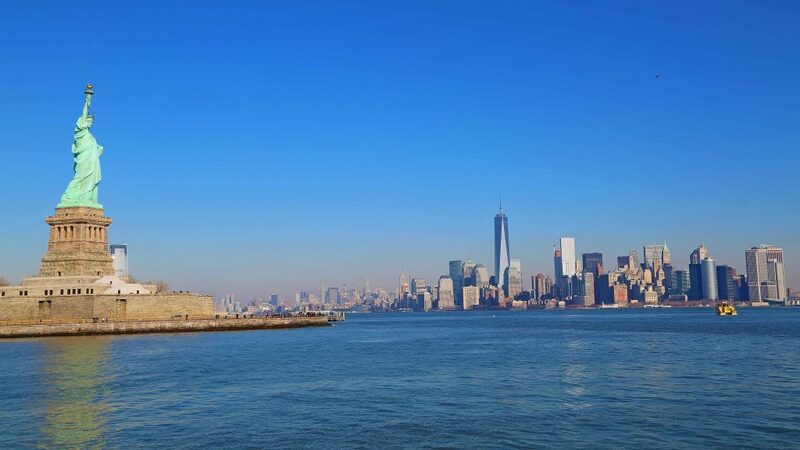 The Statue of Liberty height is 305 feet and 1 inch tall making it the tallest statue in the United States! Yes, it does! in fact, it gets struck several times each year as copper is a great conductor of electricity. Fortunately, it has a massive concrete base that was set on granite that grounds the Statue of Liberty. The Statue of Liberty is made of 3/32 of an inch copper sheeting with an iron infrastructure. the copper sheeting is about the thickness of two pennies placed together. Copper that is exposed to the elements undergoes a series of chemical reactions (oxidation) that give it a pale green outer layer called Patina. The Statue of Liberty’s face is thought to be modeled after the sculptor’s mother. The Statue of Liberty was designed by French sculptor Frédéric Auguste Bartholdi and built by Gustave Eiffel. You may recognize Gustave Eiffel from another amazing monument the Eiffel Tower in Paris, France. 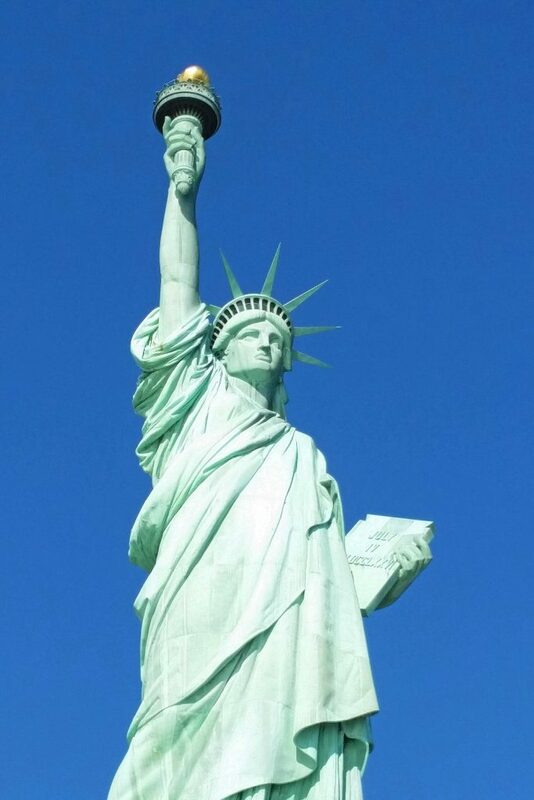 Bartholdi completed construction of the hand holding the torch in 1876. This piece was sent to the U.S. and was put on display at the Centennial Exposition in Philadelphia on May 18. It was then sent to New York City where it was displayed in Madison Square until 1882. The Statue of Liberty was shipped to the U.S. aboard the French Navy Ship Isère and arrived in New York Harbor on 6/17/1885 where it was meet with tremendous fanfare and a Naval Parade. On 10/23/1886 the Statue of Liberty was completed! There was a canvas covering the statue’s face and was unveiled at the dedication ceremony on 10/28/2017. Inscribed on the tablet is “JULY IV MDCCLXXVI” (July 4, 1776), the date of the US Declaration of Independence. President Calvin Coolidge designated the Statue of Liberty a National Monument in 1924 by authority of the Antiquities Act. The crown has seven rays. These seven rays represent her shedding light on the seven seas and the seven continents. There are other symbols of significance like her classical face and drapery suggest a Roman Goddess of Liberty, the broken shackles represent freedom newly achieved and the tablet she holds identifies the figure as an Apostle of American Freedom, Law & Justice. The Statue of Liberty faces Southeast. The Statue’s position greets ships entering the harbor and is seen as a welcoming symbol. The torch was replaced in 1986 and the original is now on display in the museum on the pedestal. The new torch is copper and covered with a 24k gold leaf. The sunlight reflects off of the gold during the day and floodlights light the torch by reflection at night. The statue can sway up to three inches with a 50mph wind while the torch can sway up to six inches! The crown has 7 rays and 25 windows. Many people depart from Castle Clinton National Monument also referred to as Battery Park. Did you know that the National Parks of New York Harbor consists of 11 parks surrounding the Harbor? How many can you list? You can print a full list of National Parks to help check off and count how many you have visited. We also have a list of the 59 National Parks.